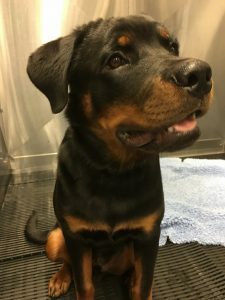 Meet handsome Jett, the 6 month old Rottweiler X Staffie who recently came in for desexing and removal of his hindlimb dewclaws. Dewclaws are the digits on the feet of dogs that do not come in contact with the ground while they are standing. Hindlimb dewclaws are generally removed to avoid injury and pain that can result when these unnecessary appendages, which can often hang or dangle, get caught on things. Typically they are only present in front feet but some dogs, like young Jett, and certain dog breeds such as the Great Pyrenees, have dewclaws on the hind feet as well. removed without complicated surgery. Having the dewclaws removed at the time of desexing is common as it means the dog will only have to go under anaesthesia once and have only one recovery period. Dewclaws on the front limbs however are attached with bone like a normal digit, meaning that more intensive surgery is required to remove them. Because of this, most veterinarians agree that they should not be removed without a clear medical reason, as the unnecessary pain and discomfort caused by the operation outweighs any benefits to the animal. If you have concerns about your dog’s dewclaws call the clinic on 02 4655 0777.